As a designer I've been struggling for years between admiring vintage and brocante while being involved in the development of new products on a daily basis. On one hand developing new products add interest to our eyes and lives and hopefully improves it and on the other hand old stuff has it charms and the weight of time. My hubby that is a designer as well solved his inner conflict by collecting vintage tools and small objects (I do not approve for large ones that will block the house, which is already packed as it is). 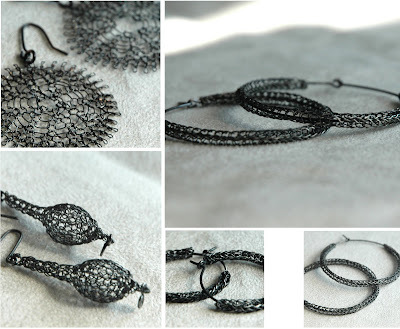 In the spirit of vintage I decided to launch a line of oxidized silver jewelry, I started with my hoops, sunflowers and drops but will continue with more with time. The oxidization gives the silver depth thanks to the different shades of gray and visual weight.